The Paw Paw Season is Here! By Edgefield Advertiser on August 21, 2014 Comments Off on The Paw Paw Season is Here! Paw paws growing on the Bill Moody tree. “Way Down Yonder in the Paw Paw Patch” is the song most folks around here grew up with: “Pickiin’ up paw paws, puttin’ ‘em in the basket” as the song continues. And Bill Moody, whose paw paws are the inspiration for this story, says: ”Listen to the words. You pick up the paw paws after they fall off the tree.” Joan Seawright Moody, his wife, brought several paw paws into the Advertiser office from their harvest, and she followed his instructions, except for one which looked so ready, and it was so pretty – so she picked it. They are apple green in color, the ripest ones having some yellow and dark spots, like the ripe banana does. This fruit came from a tree ten feet tall that Bill found in the woods in Greenwood County. 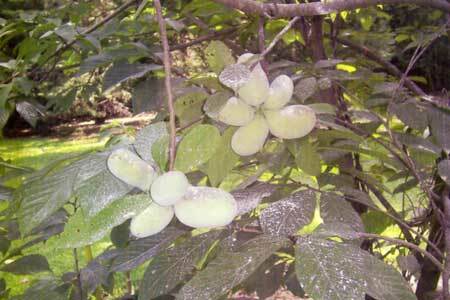 His father had two very large trees that he got from Tennessee, where paw paws are considered special. These were in the back yard where Bill grew up, in North Carolina.